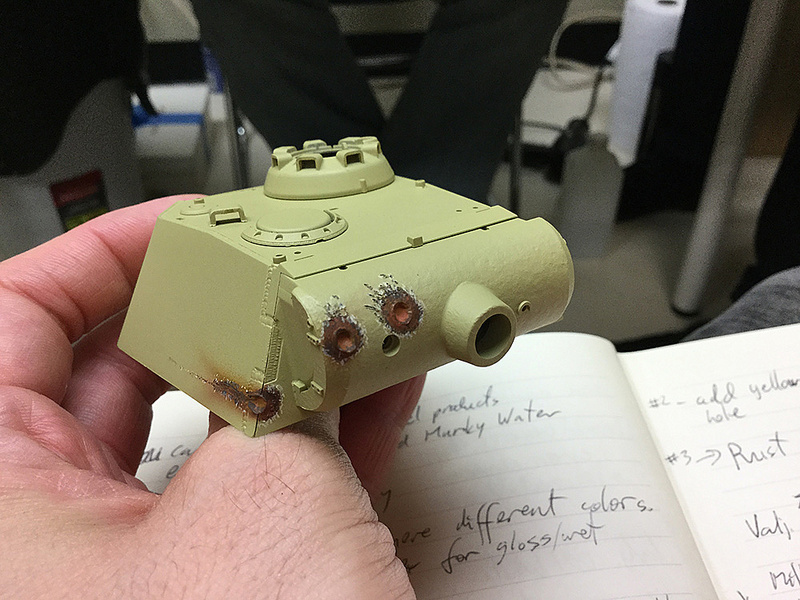 Adam Wilder demonstrated how to create realistic projectile impacts during the seminar in September of 2015. 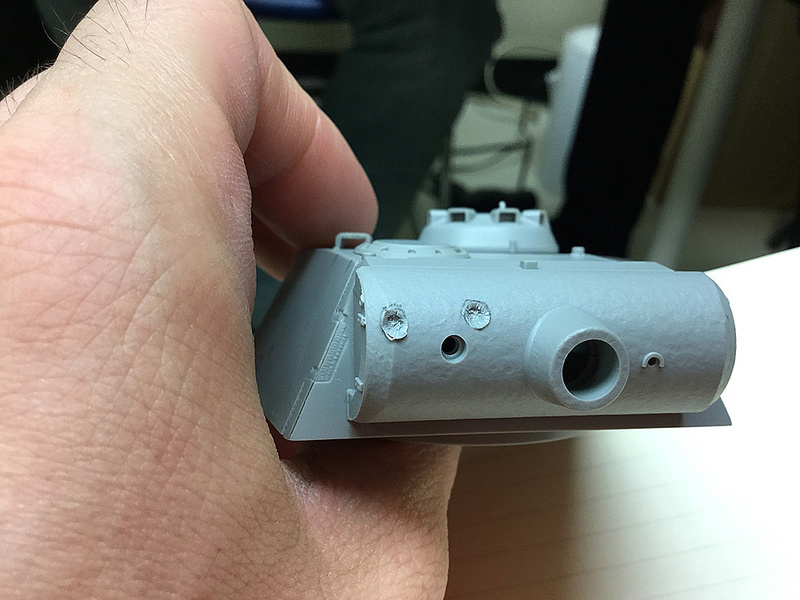 He used a Panther turret to create the demonstration sample. 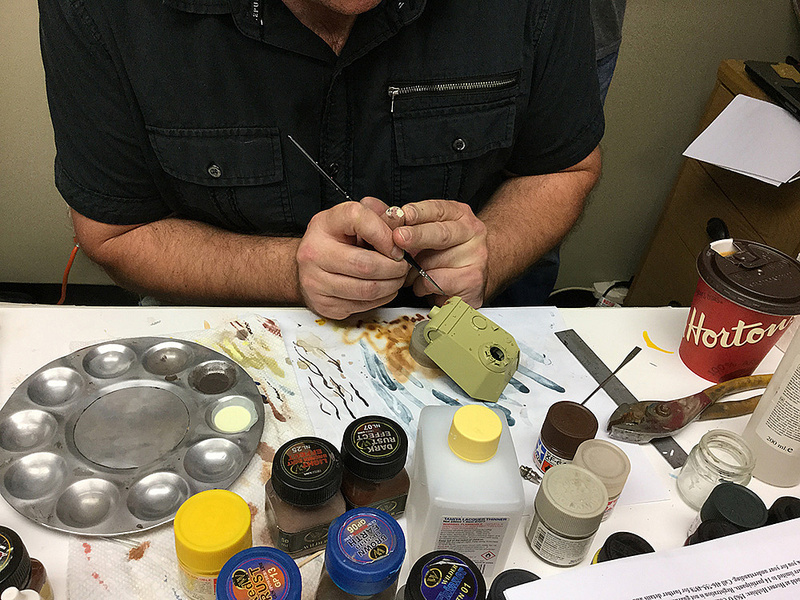 Don't miss the video of one of Adam's sessions where he demonstrates creating rust effects. 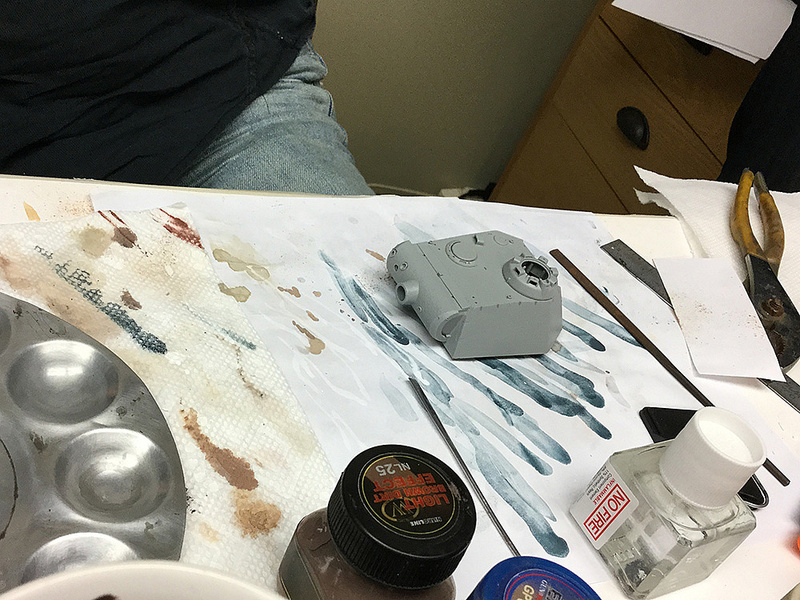 Using a rubber tip pen (artist shaper), Adam ground in a bit of Wilder Gunpowderline Bright Steel pigment, then used a graphite pencil for a slightly different tone and then finished off with hint of Wilder Gunpowderline Black pigment around the outside perimeter of the damage. 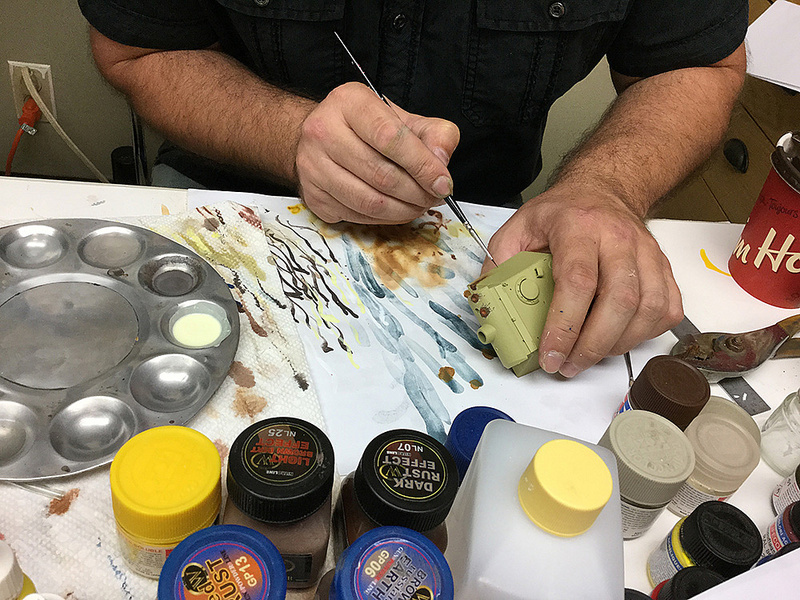 Adam mixed a milky cream colour (seen in the metal palette) to create a lighter tone than the base Dunkelgelb. 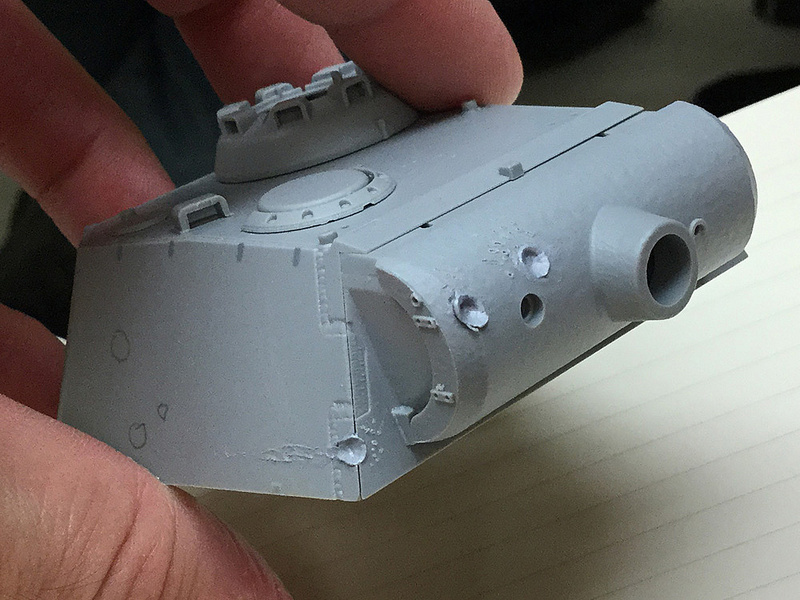 This was brushed sparingly around the edges of the impacts and shrapnel holes. 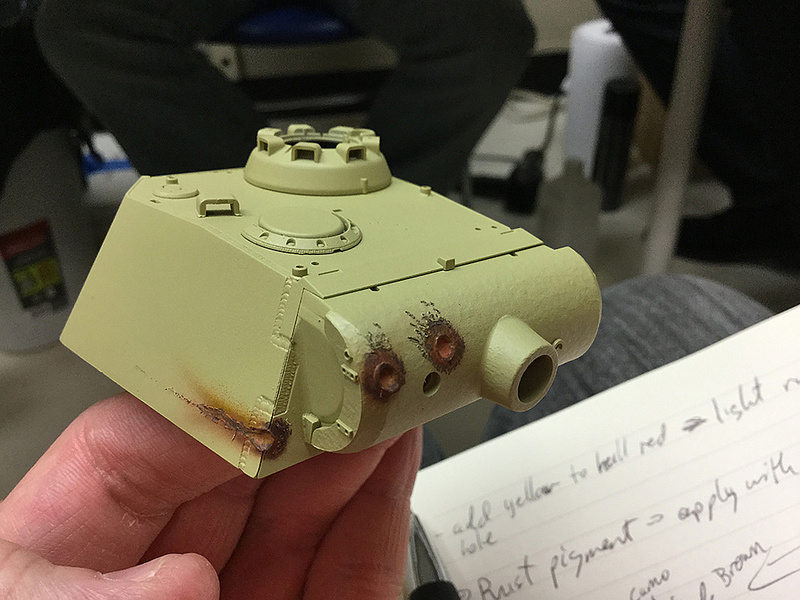 Adam brushed a tiny bit of Vallejo German Camo Black Brown in and around the impacts, and especially into the shrapnel holes. 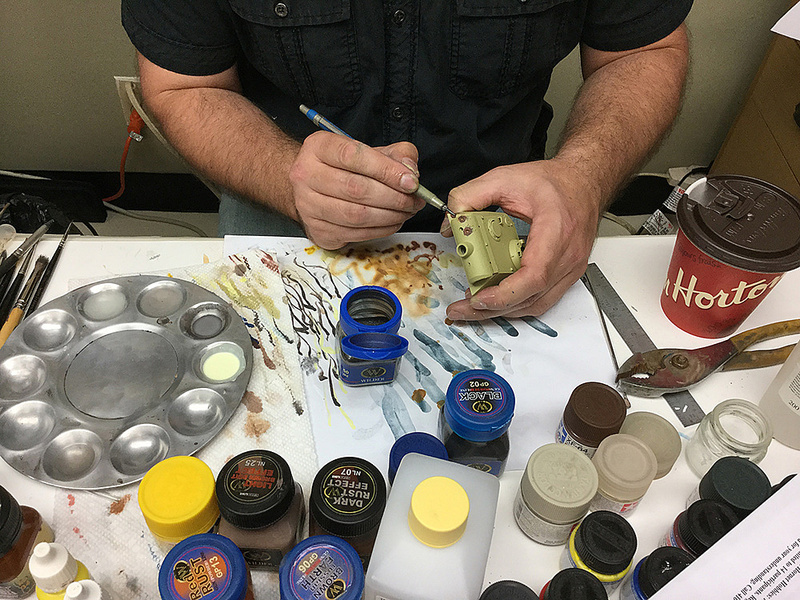 Before this picture was taken, Adam brushed Wilder Gunpowderline Aged Rust pigment mixed with Nitroline Old Rust Effect (as a carrier) in and around the impact. 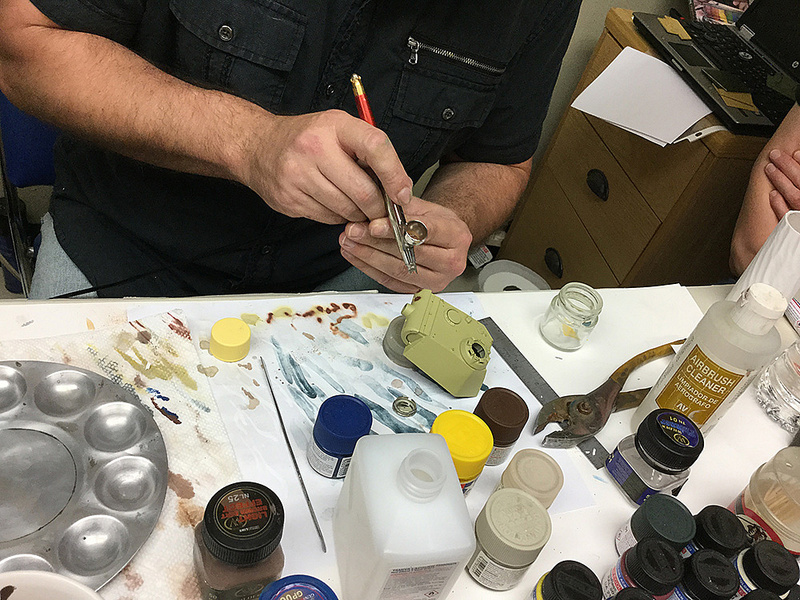 You can add yellow to the dark rust brown to lighten it. 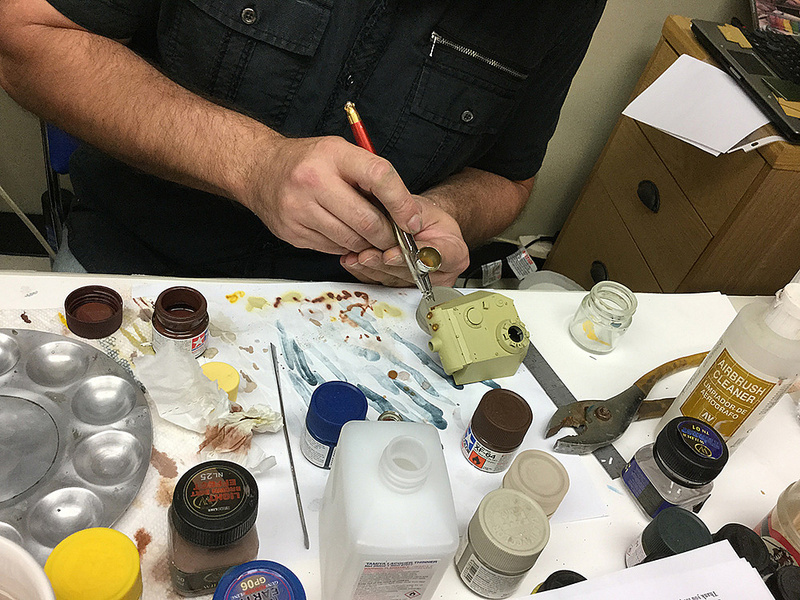 In this case Adam mixed yellow and hull red for a light rust colour and sprayed just into the hole. 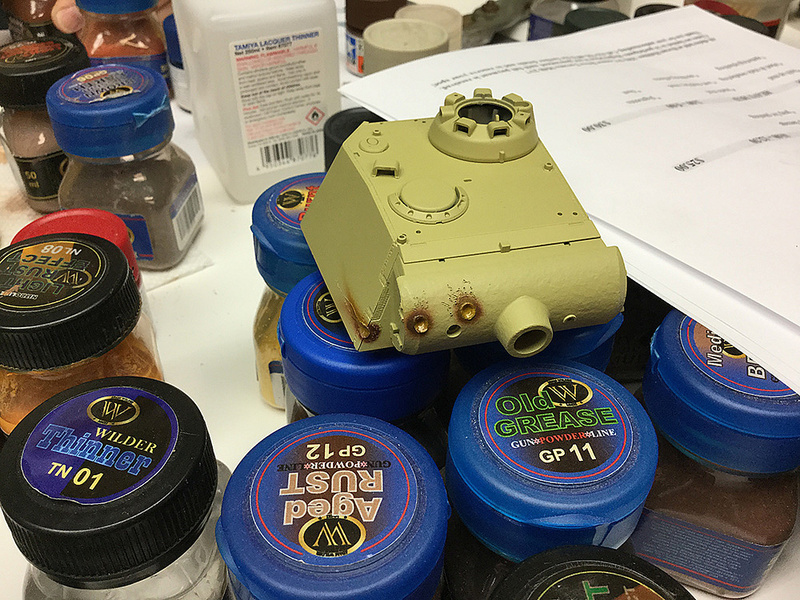 For the demonstration, Adam skipped priming and the turret was given a quick spray of Dunkelgelb (dark yellow). 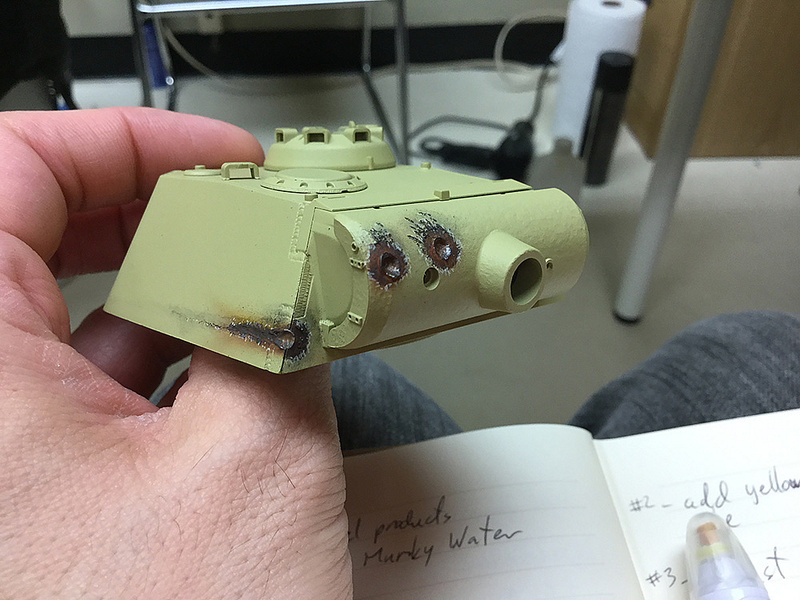 Then a dark rust brown acrylic was sprayed into and around the impact hole. 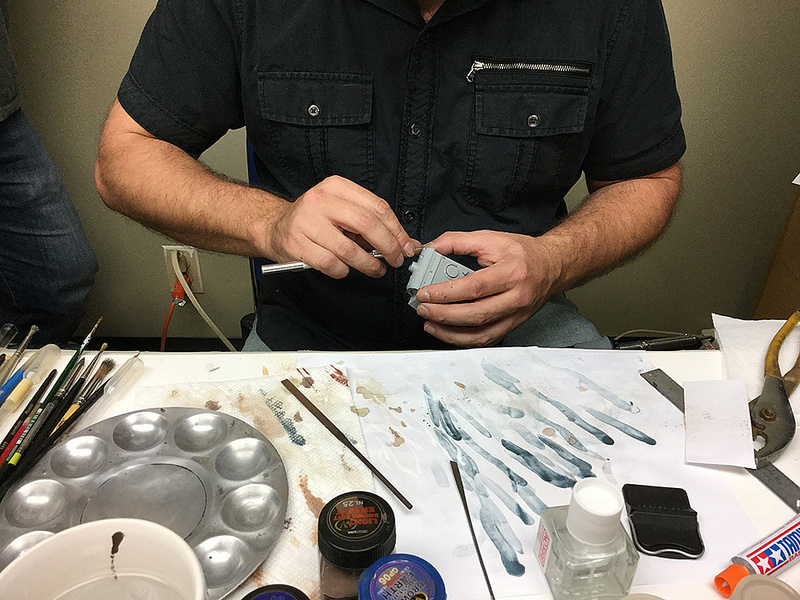 Using a soldering iron with a thin tip Adam created the tiny shrapnel damage. 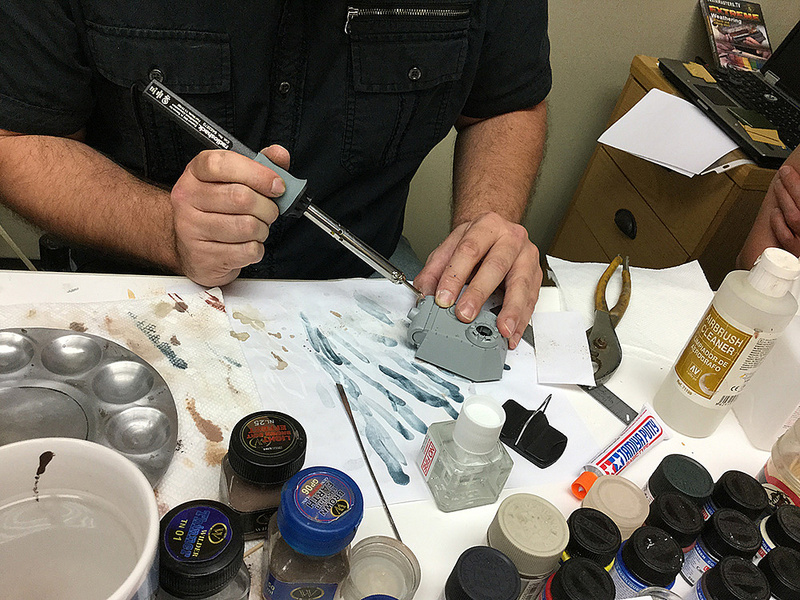 Cut the ring on the edge randomly to remove excess and add texture. 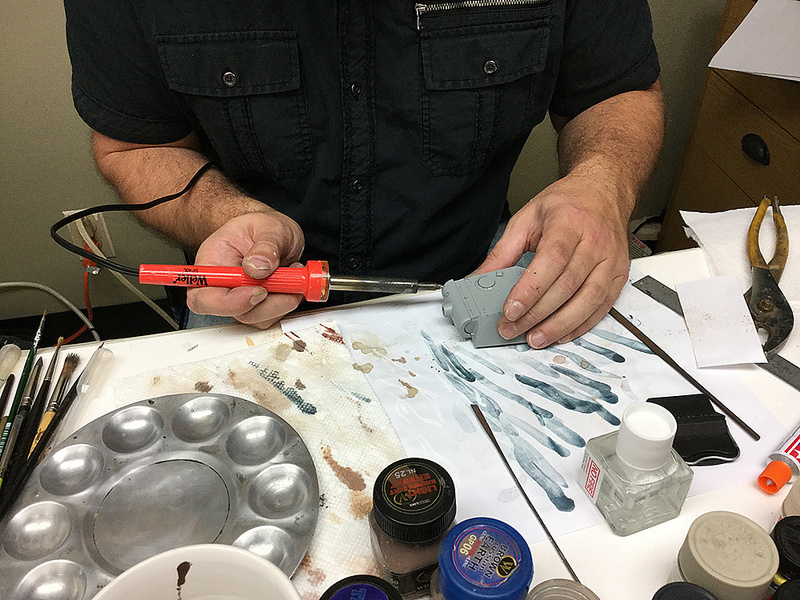 Using a soldering iron with a larger tip Adam created the impact damage.